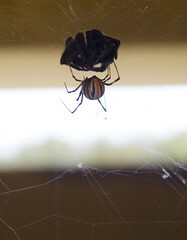 Continuing the saga of the spider in my mailbox… today I went out to check the mail. OK, I also went out there because I wanted to check on the spider. I’m fascinated and repulsed at the same time. She’ll have to go, but I’m getting quite attached to her. Oh boy, today she’s caught herself a bite to eat. Another “little” spider. One about four times her size. I can’t tell what kind of spider the dead one is, it vaguely looks like some kind of black house spider. Thick legs. The postie has been and there’s letters in there now, but no way am I putting my hand in there to get them out. If you would like to be super-creeped-out, check out the super-large version on Flickr. ~ by goatlady on January 25, 2007.
wow this is become a great story, we are on the edge of our seats wanting the next segement..
Is it eating it, or has it opened a hotel? Just kill the spider already (sending Dave works as well). Ashul: I am going to send Dave, for sure. Matt: I can’t kill her, I’ve grown attached. Dave says he’ll take her over the road to the park.